Andhrapradesh State Polycet common entrance examination test will be conducted for admission into State Board of Technical Educational Colleges for Admission into academic year 2017. POLYCET Examination Scheduled on 22 May 2017. 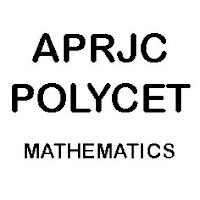 Here you can view and download Practice Bits in Mathematics Which are useful to the students who are preparing for CEEP (Polycet), APRJC, TSRJC. In these tests Mathematics subject plays an important Role.